In northern Europe, winters are long, sunlight is rare, and up to half the population can suffer from vitamin D deficiency. 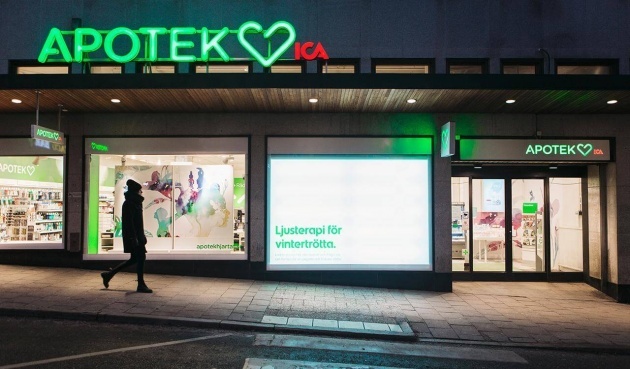 To help, Swedish pharmacy chain Apotek Hjartat decided to use its store windows to provide light therapy. Pedestrians in central Stockholm can now boost their energy by standing in front of the stores’ windows. These windows have been fitted with specially-adapted fluorescent lamps which then emit a light similar to natural daylight. The lamps flicker on whenever someone passes by the windows. The project was devised by Swedish PR agency Wenderfalck as a way to help raise awareness of problems associated with the lack of daylight, and promote healthy habits. The initiative also promotes the pharmacy as a wellness center and helps the brand take a stand.